Orange County firefighters and SA Recycling of Anaheim are teaming up for a new take on the adage. Through SA’s program, 1-800-GOT-SCRAP, cars ready to be recycled for scrap metal are instead being collected and first sent to the North Net Fire Training Facility in Anaheim. Firefighters will use the vehicles for training, learning how to extricate wounded passengers with the Jaws of Life and other rescue techniques. Then the cars will go back to the recycling yard to be chopped into metal chunks and recycled to make new cars. Donors can expect to receive $200 to $450 for their vehicles, depending on the car’s weight, said Cristi Rossi, vice president of operations for 1-800-GOT-SCRAP. A brand new service described as “recycling on steroids” and destined to benefit our planet is being officially launched. 1-800-GOT-SCRAP is available to consumers who have unwanted large-scale metal items such as old cars, dishwashers, washing machines, stoves and refrigerators that need to be discarded. 1-800-GOT-SCRAP will pick them up for a small fee or they may be dropped off at an affiliated recycling center for cash. The items are then shredded, sorted into various pure metals (e.g., steel, aluminum, copper, iron) and shipped overseas to be re-purposed into new appliances and automobiles. 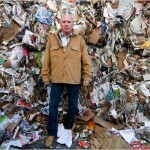 Due to the economic downturn, the market for recycled materials have taken a decline. Junk is now piling up in yards and warehouses of recycling contractors because they can’t find buyers and are not willing to sell at very low prices. Briana Sternberg, a education and outreach coordinator for Sedona Recycles, says that the junk either ends up in a landfill or begins to cost them money. It is an awful time to recycle.